An elegant open round Fruit Bowl Nantucket Basket features a recessed scrimshaw disk in the hardwood ash wood base! This Nantucket basket features a highly grained ash wood base, which has been chamfered on the bottom and broadly rounded over on the top, with a recess routed into the base to accept a bone scimshaw disk. The hand-tapered and beveled ash wood staves have been meticulously hand-placed with only a whisper of space between the staves - only enough for the thin cane weaver to pass through. Nantucket-grade cane is used to weave the body of this basket, tightly compacted down giving this Nantucket basket the ability to essentially hold water - a hallmark of my basketweaving skills. The hardwood ash wood rims are steam-bent and formed on a wooden basket mold for a perfect fit to this Nantucket Fruit Bowl Basket. Pre-drilled and nailed with thin brass escutcheon pins, cut flush and peened over, then sanded smooth. A round 3/4" scrimshaw bone disk will be attached to the routed recess in the ash wood base, giving this Nantucket Basket bowl a very elegant look. This deep Nantucket Fruit Basket is crafted exceptionally sturdy for every day use with the use of hardwood ash staves and hardwood rims. Very lightly stained in a golden oak stain for added charm and to mellow the raw ash wood baskets staves. Every Nantucket basket I personally handcraft is signed and dated on the base prior to final finishing. This final finish includes hand-applied varnish and clipping of any stray cane hairs which are prone to appear during the basket weaving process. These and many other fine craftsman details set my Nantucket baskets apart from all others. An excellent Nantucket basket for serving or displaying fruit! (As with all finished baskets, please use a fabric liner.) Special enough for a corporate gift basket or fruit gift basket! 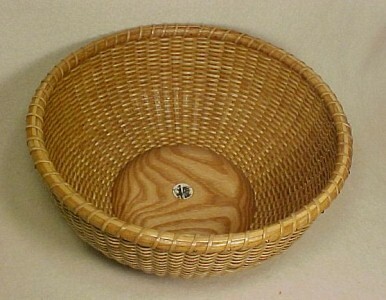 The Fruit Bowl Nantucket Basket measures 10.5" diameter and is 4.5" high at the rims. Although I am no longer accepting orders for the Nantucket Basket Fruit Bowl, I do craft one or two of these per year. When its ready for sale, you can purchase it directly from my Simply Baskets website.